Earlier this week a friend reminded me of the existence of this photograph. It’s a great photo. Jean-Pierre Léaud, standing before a painting of a younger version of himself playing a younger version of the director of the film that gave him his career. 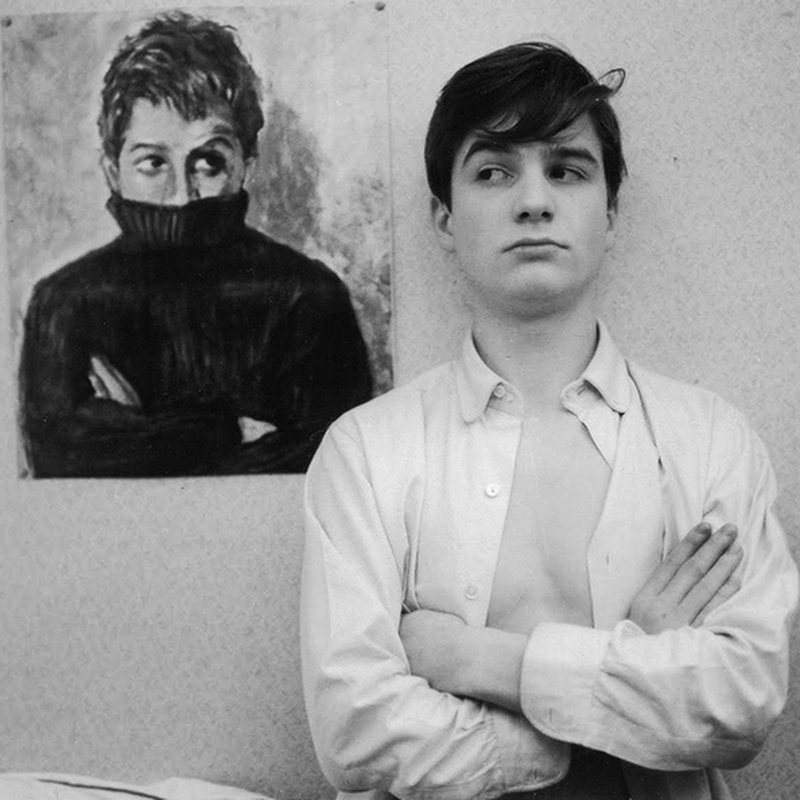 I was reminded that as a 19-year-old, in my second year at university, making all sorts of wild discoveries about cinema and literature and philosophy and the world in general, I was smitten with Léaud’s face and the privilege of watching it change and mature throughout Truffaut’s Antoine Doinel series. The first in that series, Les quatres cents coups (The 400 Blows, 1959), is the film that changed my relationship to cinema. As I wrote here back in 2012 – https://inalonelyplacefilm.wordpress.com/2012/03/20/the-film-that-changed-my-life-francois-truffauts-the-400-blows-3/– it opened a whole new world up to me and a whole new idea about what a film could be and could do. I was also inadvertently reminded that as a 19-year-old, while browsing the stacks in the university library, I found this photo of Léaud in a book about Truffaut, swiftly tore it out and folded it into my own notebook. As a lifelong bibliophile and longtime bookshop employee the vandalising of books of any kind is not something I’m proud of. I did that once and I’ve never done it again. And I’m not really even sure why I did. I didn’t think, I just acted, high on cinema, under Truffaut’s spell, enamoured with that skinny French boy, his pensive black eyes, Gallic nose and cheeky grin. The photo remains in my possession, a little yellow now, pasted neatly into my copy of Hitchcock by Truffaut although I’d forgotten, until this week, that it was even there. So on the occasion of my publicly outing myself as a book vandal I want to take this opportunity to republish a short piece I wrote last year as part of my Critics Campus coverage for the 2014 Melbourne International Film Festival. I’ve been thinking quite a bit lately, after recently reading Jean-Paul Sartre’s The Age of Reason, about what it means to ‘grow up’ and realised it’s a process that never really seems to end, that isn’t always pleasant, and that in some ways never sorts itself out. Adolescence is a time of exploration and discovery. The 400 Blows (1959) remains one of the most moving films I have ever seen about the adolescent experience and Antoine Doinel an enduring icon of besieged youth. Director François Truffaut and his cinematic double, Jean-Pierre Léaud, paint a picture of the teen experience as a painful one, its spirit of freedom in conflict with the constraints imposed by others. Antoine’s thirteen; only just a teenager and in many ways still a child. His mother’s uncaring; she didn’t want him and he knows it. His father’s less cruel, but still indifferent. Luck isn’t on Antoine’s side. He tries to be good, but repeatedly finds trouble. I was at the end of my adolescence when I first saw The 400 Blows. I’ve seen it many times since. But revisiting it as an adult, more vivid to me than ever is Truffaut’s masterful play with space and movement and how they draw us into Antoine’s story. As adults our workplaces, families and other social obligations can restrict our movements. Childhood’s freedom is a nostalgic wish, maybe even a dream. I see my own childhood come to an end in Antoine’s story and my empathy for him is stronger for it. In Antoine Doinel, as many others do, I see myself. Truffaut takes up the cause for liberty from the film’s opening credit sequence where the camera moves freely through the Paris streets, to a gorgeous, melancholy score by Jean Constantin. He then hits us with a sharp contrast, shifting to the drab classroom where we meet Antoine, who is forced to sit still. Exteriors suggest freedom and release. Antoine’s movements, as he plays truant and runs around with his friend René, are as light and expressive as that opening sequence. He has a smile on his face. Life is his to live; the city’s streets his to discover. Interiors, like the cramped confines of his family’s apartment and the regimented space of the classroom, represent entrapment and restraint. Antoine’s bedroom – a tiny, gloomy corner between the kitchen and the front door – offers little space for self-expression. The cinema is the only interior equal with freedom and creativity, and Antoine frequently escapes into its clandestine darkness, as Truffaut himself famously did at his age. But it’s The 400 Blows’ extended final sequence – in which Antoine breaks free from his reform school group’s soccer game and runs to the ocean – that best captures this tension. It’s a seductive scene when you see it as an adolescent, but no less so through adult eyes. We are running with him, encouraging him. It doesn’t matter where he’s going. What matters is that he’s free again. And then he’s not. The 400 Blows famously ends with a freeze-frame. Antoine reaches the ocean and has to stop. The camera zooms in and he turns to face us with an expression of both hope and fear. Truffaut traps him in the frame, but why? When I first saw The 400 Blows I thought Antoine might step out of this film into another. While he’s frozen in the shot it doesn’t seem possible that the narrative can contain him. I didn’t know that it couldn’t; that Léaud would play Antoine in five films over twenty years. He will move on, fall in love, marry, separate, and the struggle will always be the same one, between freedom and constraint. In this final shot, Truffaut pictures nothing less than the entire riddle of growing up.